I had a customer call me to tell me his bees had swarmed and were high up in a tree. I told him that he needed to get a hive box as high in the air as he can. He really didn't have a deer stand so he elected to put the hive boxes on top of his truck. The truck was parked near the swarm tree. Within an hour the swarm had found the hive box and had moved into the hive. A shout out to Trevor, nice move on catching the swarm. I have been looking for some nectar plants. I have some positive news. I had to do a road trip into Wisconsin tonight. The Lift Bridge is closed so I had to go the long way. As I was driving on 94 near Hudson, I did see some White Sweet Clover blooming in the center median. 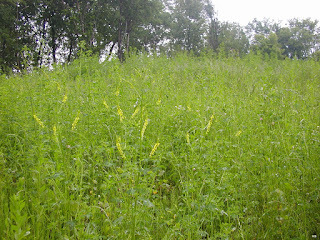 Sara in Red Wing emailed me and said she finally has the White Sweet Clover blooming down there. As I was coming home through Stillwater tonight, I did see some Basswoods blooming near Cub foods. So it looks like some things are moving forward, let's hope the nectar is there for our hungry bees. Whenever there is a weak nectar flow or on and off nectar flow, swarming can be an issue. Unreliable nectar intake this time of year, makes the bees nervous that not enough food is coming in and they may have to leave to find a more steady food supply. Stay on the looking for swarm cells program during this time. If the weather warms up and the nectar flow gets more steady, the swarming issue will lessen. I have noticed my nectar flow has slackened off around my place. The way I know without even looking at my hives, is bee behavior. The bees were coming in my garage smelling the beeswax on the frames with new foundation. The bees are looking for nectar. I had a frame feeder sitting by a nuc box. It had a little syrup in the bottom of the feeder. Bees were flying into the feeder getting the syrup. This behavior has been subtle. Just a few bees hitting the syrup. There is a nectar flow going on, but it has diminished and bees are searching for new sources of nectar. When the bees discover a nectar source, foragers come back and waggle dance on the combs inside the hive. This dance tells the bees the direction, distance from the hive and intensity of the flow. Being that it is a nearly empty feeder, the nectar available was small and not too intense. That is why only a few bees were there. There must not have been much excitement in the hive for the feeder syrup. If it was late August I would have 10,000 bees on the feeder in a half an hour. Weather change: The warm temperatures that are coming later in the week should get the nectar going again. White Sweet Clover is still missing in action. Basswoods should be blooming in a week or so. At least that is when they should be blooming. Bee Venom in Cancer Treatments? I finally got around to checking out a trail camera that is back by my beeyard. These are a couple pics from last winter. When the bees start filling the hive with nectar, they usually will fill the brood area with honey first. There still is plenty of brood and eggs in the brood box, but the bees pack in the brood area first. As more nectar comes in, and there is no where left to put honey, it is at that point, the bees move into the supers. For the bees, it is about survival. They will fill their living area first, so there is honey for the future survival of the colony. Beekeepers always blame queen excluders for their problems with honey not being stored in their supers. This really is not the case. I know a commercial beekeepers who runs 9000 colonies. He uses queen excluders on all his hives. He sees value is using excluders. Most beekeepers with more than a couple hives use honey robber with fume boards to remove their supers. Honey Robber is a odor repellent and makes bees leave the supers quickly. If any brood gets laid in a super, the bees will not leave the brood no matter what is used. This make supers harder to remove and more labor is required to get the bees out of the supers as the bees have to be brushed off the frames by hand. If the excluders were causing him to get less honey, I am sure he would not use them. 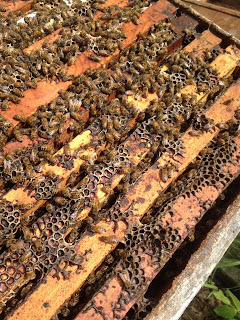 Colonies with new supers and bare foundation, I usually suggest that queen excluders are left out until there is a little wax and nectar on a frame or two in the supers. At that time I would put in the excluder. On my hives with drawn comb, I put the supers on top of the excluder and the bees move up into the supers when they are ready. Excluders don't cause swarming. 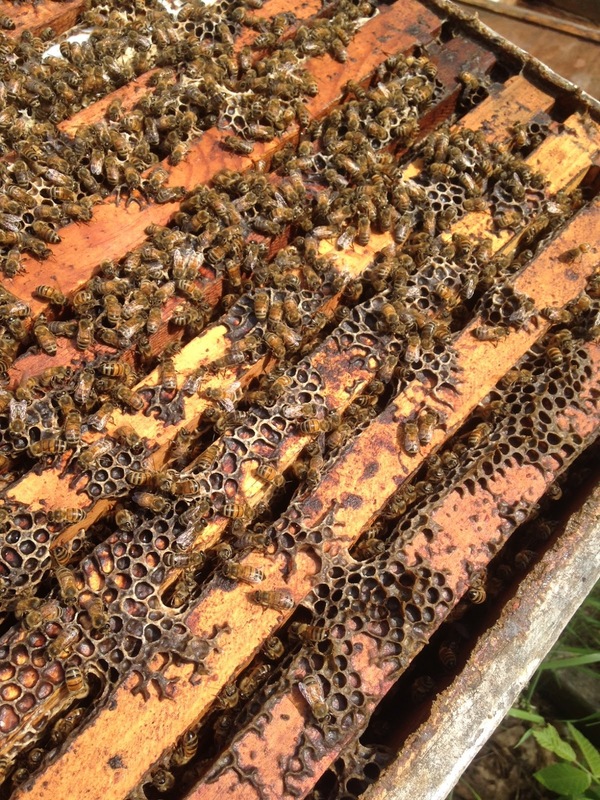 Lack of management by the beekeeper causes swarming. Beekeepers should still be on the seven day checking for swarm cell schedule. If this schedule is not followed, the bees may swarm. If you are not getting any honey in your supers after a week or two of the start of the nectar flow, your hive may have swarmed or you are in a poor nectar area. When a hive swarms the field bees leave. These are the same bees that will bring honey to the hive. If the field bees leave in a swarm, there are not enough field bees to produce excess honey and the hive is unlikely to have any honey in the supers. How do you know if this has happened? If you look in the brood box and see no eggs or young larvae, probably some queen cells the hive probably has swarmed. Do not remove the swarm cells at this point, this will be your new queen. The bees may fill the brood area solid with honey as the brood hatches out. Honey is coming in, hopefully you should see a a few full supers soon. I was out in my back bee yard and noticed my Catalpa Trees flowering. Catalpa Trees have very large leaves and produce large bean pods. The flowering usually means the timing is right for the start of the nectar flow. The Catalpa trees don't really secrete nectar, and I have never seen the bees work the Catalpa flowers. But, the timing of their bloom usually coincides with the early part of the main nectar flow. I added supers on my hive by the Catalpa's yesterday and noticed the top deep box was solid honey. 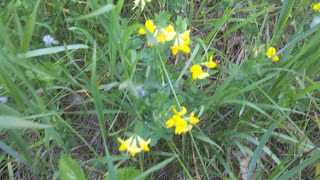 I have White Dutch Clover and Birds Foot Trefoil blooming in large numbers near my bee yard. The next week will be perfect weather for Mite Away Quick Strips (MAQS) mite treatment. The temperatures will be in the mid to upper 70's. If you have done a mite check or just want to treat to knock down the existing mite levels, this is the time. Hives that started with package bees will have mites starting to creep up in numbers from when the package was hived. A single strip of MAQS now will knock down the mite levels until about August, when a full treatment should be applied. Overwintered colonies that were not treated for mites in the spring, should consider a full treatment of MAQS now before the mite population starts causing damage to the bees. MAQS can be used during a nectar flow when supers are on the hive. I had this video on a couple weeks ago but a refresher is always a good. Hives are still building up and should be nearing their peak populations in the next couple weeks for most of us. There are some beekeepers with some lagging hives, like a couple of mine. But they will be looking much better soon. Swarming is still happening, keep checking for swarm cells. Once the nectar flow starts coming in heavy, that should give the bees other ideas other than swarming. The nectar flow in Stillwater isn't real strong yet, but that should be changing soon. I haven't seen any white sweet clover blooming yet around my place yet. 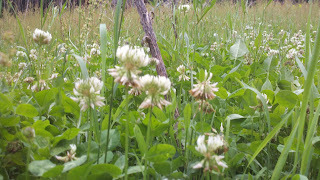 Alsike clover is blooming in my lawn and back in my field near my hives. I have seen the bees working it. This rain we have just received was a god send. The lawns were just starting to get a little brown. But now with the rain yesterday and today, plants will be green and robust. I think bees make more honey when it is a little dry than a little wet. But, brown and crispy is a little too far and puts most nectar flows to a dead stop. Most of the first cutting of hay has been harvested. I was getting a little Alfalfa nectar coming in until it was cut. Alfalfa gives more nectar after the first cut. The second cutting of hay, is usually early to mid July. So I have to be patient. My wife's garden is coming in very nice. The bumblebees have been working some of the plants. Nectar plants to look for: White Sweet Clover, Bird's Foot Trefoil, Basswood/Linden trees (around July 1st), White Dutch Sweet Clover. See some flowers? Are the bees working it? Find out what it is. The nectar flow is coming, very soon, to a hive near you. The next three days will be very hot. The heat can bring out swarming in a hive. So make sure the entrance reducers are out and the slide is out on screen bottom boards. When it is very warm, it is normal to see bearding in front of the hive. It does not mean it is a sign of swarming. Bearding is just the bees trying to keep cool. The hive is hot so let's sit out on the porch type of thing. Mite tests should be done on colonies soon. A beekeeper should know where they are for mite loads. Some beekeepers just treat for mites without testing. The only mite treatments that can be put on now with supers on is Mite Away Quick Strips (MAQS). Some beekeepers put one strip in for a knock down effect on the mites. Then do a full treatment of two strips in mid August. Having low mite levels is the key to bee longevity. Hive populations should be getting big now, so get the supers on to get a big honey crop. The MN Honey Producers are having their annual convention July 13 - 15th in Walker, MN, at the Northern Lights Casino. There are some great speakers on the agenda this year. Dr. Meghan Milbrath whose post of Why Did My Bees Die explained to many beekeepers what they are doing wrong with their bees. There will be a customer appreciation day at Mann Lake LTD.
A new bee club is starting up in Prior Lake area. could be a contact if someone wanted more information. Thanks again. We hope to be a good support to one another and keep our bees healthy and happy. I did see some yellow sweet clover blooming in a ditch yesterday. This usually suggests the main nectar flow is getting ready to start. Yellow Sweet Clover does not give huge nectar flows in eastern Minnesota because it is too humid here, but where it is drier in the western part of the state and the Dakota's it is the major honey crop. In the Dakota's one hive can give you 300 to 500 hundred pounds of honey per hive when they get enough rain to keep it green. This year the Dakota's have been too dry and the Yellow Sweet Clover flow is going to be a bust. White Sweet Clover will be blooming soon. White Sweet Clover is the honey crop for most of us. Supers should be on your hives now if they are ready for them. I talked to a commercial beekeeper who runs 700 colonies. He says he has been having a heavy flow of Black Locust honey. He told me that all his colonies have filled one super of honey. He runs deep boxes for his honey supers. Deeps weigh about 90 lbs when filled and capped with honey. This hive is having a nectar flow. New white comb can be seen on the darker burr comb. The white new wax means nectar is currently coming into the hive. This is a way to identify a nectar flow. The weather this coming week is perfect bee weather. The warm temperatures will be getting many plants towards their blooming stage of their lifecycle. There is an old saying that the nectar flow starts about 10 days after the first clover is spotted. 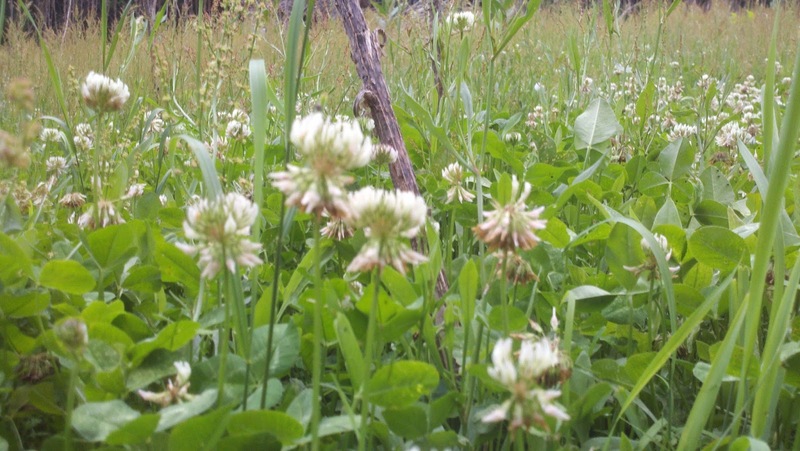 I had clover blooming in my yard about four days ago. Supers should be put on now on any colony that is ready for them. The southern part of the state of MN may already be into a nectar flow and it may be coming very soon into the metro area. Black Locust trees are in full bloom right now. I was driving east on Hwy 36 last night. I saw several stands of Black Locust trees blooming between Dale and 35E on the southside of the road. Package bees, if the bees are done drawing comb in the deep boxes put your supers on now. If the colonies are on their last box, monitor them closely. Colonies with just have a frame or two to finish, it would be best to put the supers on. All colonies right now are exploding with bees. There may be six frames of brood emerging in a very short time. A deep box of foundation that took a month to draw out a short time ago, now can be finished in ten days. Colonies drawing foundation still should be fed syrup, but that may be ending soon. Weak colonies are the exception and still may need syrup on for a while yet. With the higher populations everything will change quickly. As beekeepers, we need to be prepared for the changing condition of the hive. Colonies should be checked on a seven day cycle for swarm cells. When putting supers on with new foundation, the supers with foundation need to be put on so they are located right above the brood boxes. Supers with already drawn comb can be stacked on top of each other. As the supers fill up and a new super is needed, supers with foundation are put underneath filled supers. Supers with drawn comb, just keep stacking them on. I do use queen excluders on all my colonies. But with new supers with new foundation, I usually leave the queen excluder off until I see wax and nectar on a frame or two in the first super. I do quick check of the supers looking for a queen, if she happens to be there, I encourage her to move down into the top deep with a little smoke. I then slip the excluder underneath the supers. Supers go on two at a time. This time of year, if the honey flow starts off with an intense flow. As super can be drawn out, filled and capped in one week. Check your colonies once a week to monitor the progress of the supers. The honey flow is almost here. Beekeepers have worked towards this goal all spring. We have nurtured small colonies from three and four frames of bees to a hive that is packed top to bottom with bees. We are now approaching the payoff with boxes of golden nectar. We are sold out of queens for 2017 and will not be getting anymore this year. The nectar flow is coming very soon. This is the time of year reversals cause confusion. Normally on package bees with new foundation, when the bees finish their last box, beekeepers should do a reversal. Bottom box is changed with the top box. Bottom box to top, top box to bottom. The reasoning is this, there is more pollen stored in the bottom box, with the bottom box now on the top, when the nectar flow starts the bees will fill the top box with honey. This honey is the winter stores for the colony. During winter the bees will move up into the top box sometime in late January. As the bees uncap honey for winter food, the bees will expose stored pollen. The queen will start laying around mid February. Now that there is brood in the colony, pollen is needed to feed the young larvae. No pollen means no brood. The last reversal has helped to insure that pollen will be available. So now the confusion. If a package colony has not finished the top box and the nectar flow starts. The bees will fill the top box with honey. If the top box is very heavy and is filled with honey it is too late to do a reversal. 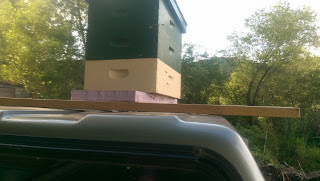 I have had several customers do a late spring reversal and put the top box full of honey on the bottom of the hive. Their bees died over the next winter because all of the winter food stores were on the bottom of the hive. The bees will not move down to get honey. The bees may starve even though there is a large amount of food stores in the bottom of the hive. So what to do? If the top box is full and you missed the reversal opportunity, grab a frame of pollen from a lower box and put it into the center of the top box. The bees will fill in honey on top of the pollen. This will give the bees some available pollen in February. If this doesn't work for you, pollen patties can be given to bees a little earlier than normal to fill the pollen gap. There has been some European Foulbrood (EFB) being reported by several of my customers. European Foulbrood can come with a cool wet spring. This type of Foulbrood can clear up on its own. It does not leave scale that reinfects colonies. But treating with Terramycin clears up EFB very quickly. European Foulbrood responds well to Terramycin , an antibiotic. Speaking of antibiotics, several beekeepers that have this problem tried to purchase some Terramycin to treat their bees. But there was a federal law change. and beekeepers can no longer purchase antibiotics without a veterinarian visiting the hive, looking at the hive, troubleshooting the disease, then writing a prescription. The beekeepers with the sick bees called a few veterinarians to help them. Most were uninterested and did not know anything about what the brood diseases looked like anyway. So what traditionally was a problem that beekeepers fixed, now will cost them some major money to fix. A vet visit, a prescription, what is that going to cost. I can't imagine a vet doing a site visit for less then $100.00. I think the result of this law, while intended to keep antibiotics out of the food chain, will result in colonies going untreated and may cause widespread colony outbreaks on some infectious diseases such as American Foulbrood, because beekeepers will not pay that vet fee. I think a better solution is requiring beekeepers to get a comp card like a pesticide applicator would have to get. There is only a few diseases that beekeepers need antibiotics for. So, a short course of disease identification is all that would be needed, a test to prove that a beekeeper is competent, and a card is issued. The card would give the beekeeper the license to purchase the antibiotic. By getting a vet involved in disease troubleshooting is bad business for beekeepers but good for vets. In my opinion, this sounds like a money grab by the Veterinarian political lobby. What is the next step, prescription for mite treatments and pollen patties? I think it is time to put some heat on our federal Congressmen and Senators . The next couple days will be getting quite warm. Any colonies in at least two deep boxes should have their entrance reducers removed off their hive. Leaving entrance reducers in on very warm days can cause a hot hive. The bees may be bearding in front of a hive and can cause swarming issues. Tomorrow, Thursday may be 85 and humid. It would not be surprising that strong colonies will be bearding out the front of the hive even with the entrance reducers out.